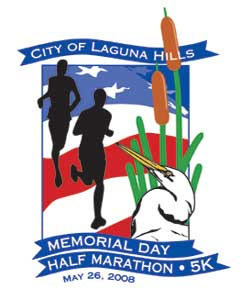 This race is formerly known as the Saddleback Memorial Day Half-Marathon. Saddleback/Laguna Hills was my very first race, and I basically finished 19 minutes faster this time. So anyway, it had actually been drizzling during the hour before the race. Luckily, my sister, who was a spectator this time, let us sit in her car until we decided to hit the port-a-potties. The long lines caused us to reach the starting corral about a minute before we took off. The rain stopped. The first mile was a little jammed as we ran through the Laguna Hills Mall parking lot. Since this race isn't all that big, the field cleared a bit starting at the second mile. I hammered the first two miles in 15 minutes. The hills in the first few miles were mellow. We reached some reserves, where the majority of the miles were, which started off downhill and then started going up and down for the rest of the race. At around mile 7, "someone" spotted me about to hit the turnaround point as well, and he cheered for me. I realized soon that I was only about 1/4 mile behind him. The rest of the race's hills were more intense (basically having to run up all the downhills from the beginning), though in comparison to recent races were not much. Around mile 9, I was feeling exhausted and let up on my pace a little bit and even started walking for brief times to keep my energy and sore shin/calf in check. I had taken off my visor several times because I was starting to become uncomfortably warm and was trying different breathing techniques to get more oxygen to my stiff legs. Finally, I saw the finish line and tried my best to sprint to it, but I think at best I just ran to it quickly. This was a PR for me (if you read one of my previous race entries, you will see that I had predicted this). I actually was not planning on doing so well and had long decided that I would just do this race to have a good time. This is actually my last race for a few months, which is good, because my three-week shin soreness is probably an indication of fatigue. I've done 5 races in the two months following a marathon... not good. This was randomly bought at a Sports Authority in Vista, CA. 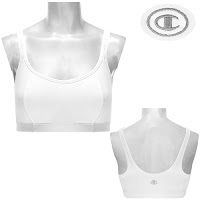 If you're a chick, you'll know that having a slightly padded sports bra is important if you're going to be wearing any technical clothing to run, at least in public. Overall, these were a good investment. They were about $18, though they normally run for closer to $40. One thing that could be improved upon is the fact that it looks like something a granny would wear. They had black ones, but I am not that girth-y or well-endowed, so I had to settle for this one. Fortunately, the white one I got is still clean-looking, strangely enough. It doesn't soak up too much sweat. Instead of miserably studying during the weekend before finals, my sister and I headed to Solvang, CA (half an hour from Downtown Santa Barbara) to run this half-marathon relay. I really needed a break, and this quaint little town definitely took me away from it all. We had a fun day walking around, eating, and looking at merchandise that changed colors in the sun. And, of course, I nearly got a heart attack when we could not find our names at the registration table. Apparently, relay teams were listed elsewhere. Whew! I woke up at around 5 AM to get ready and head to the bus, which would take the first-leg runners to the start. I wound up waiting/standing in the cold or in a saloon for more than an hour. I checked in one of the hotel towels that was keeping me somewhat warm... that I never got back. And with no national anthem, announcement, or anything, the race started 15 minutes late. The first mile, without even knowing it, I ran in about 7:40, which pretty much smashes the timed mile I did on my own about a year ago. Then the rolling hills started. I tried not to let the sight of them demoralize me too much. Honestly, I think my fear of hills is purely psychological. The view was nice... open, country-ish roads, cool air around me... At the 5k point, I looked at my watch and saw that I had also beaten my 5k PR by about one minute. I was pretty up in the pack, which was a new experience for me. Another half mile later, my left shin/calf, which had been tightening the whole time, started to become downright painful. I kept going but soon got to a point that if I did not stop, I would probably cause "permanent" injury. So I walked for a minute or two and then decided that I should not be walking when someone else is waiting for me. I picked up some speed and eventually felt somewhat better during the last two miles and made up for some of the lost time. At the 5.8 mile mark, I saw my sister waiting for me in the transition area. There was also a crowd there, who looked excited to see the "hand off." I was happy to be done -- it reminded me too much of a 10k, and I really don't like that distance at all. I hopped over to get some water and my medal. I was the first person on the bus to the finish line, where I was hoping to see my sister finish, which I did. I left the hotel at around 6:45am, walked over to the line to catch the bus to the transition area in Los Olivos. However, while in line, I remembered that I did not have my Garmin or Ipod on me. So I had to get out of line and run back to the hotel. Then I left the hotel for the second time at around 7am. The bus ended up taking everyone to the start line in Santa Ynez and from there we had to hop another bus to the transition. The bus lines at Solvang Park at around 6:45am were really long. I think 2 bus loads of people were late to the start. Probably due to poor time management on the organizers' part. On the way to the transition area, I saw Julie running. Really weird to get that perspective of a race. I've always ran with her so it was weird to see these people running and me going ahead of them on a bus. When I got off the bus in Los Olivos, I quickly jumped into a porta potty and waited nervously for Julie to arrive. There was barely anyone there at the point. Just mostly volunteers and a couple of spectators. When the front runners started to appear, I knew that it wouldn't be long. Then I saw Julie running towards me and as soon as she saw me, she picked up her pace. We did not exchange any words during the "hand-off". After Julie slapped me some skin at around mile 5.8, I took off running. I had been waiting there for about 20 minutes and was starting to get nervous on top of being cold. I was actually going to tell Julie that I saw her running while I was on the bus on the way to the transition area but there was just no time. Perhaps in my mind, I had pictured a more "slow-mo" hand off where to got to chat and catch up. Yeah, that didn't really happen in real life though. About 1.5 miles into the second part of the relay, I got this feeling of deja vu because the first hill reminded me of La Jolla. I know, so weird, but since I was still fresh, I pushed up the hill and on all hills to follow. I was determined to run the second leg in under an hour so I had to haul it. I was running like the wind amongst horses and cows (real animals not talking about the other runners) and lots of beautiful scenary. I think there were a couple of water stations but I only stopped twice for water. The hills were rolling and challenging and I could not ask for better weather. It was overcast and cool. I think it was this reason that I was able to come in under an hour. I completed the second portion at a 7:30 pace. When I finally reached Solvang, all I wanted to do was finish so that I could stop running. When I finally made it across the finish line, all I wanted to do was breathe, ok it was more like sucking in air. I skipped the food area as I didn't think I could have eaten anything so we grabbed our complimentary SD Half wine glasses and walked back to the hotel. Our hotel was literally steps away from the finish line. How awesome is that? One of the best runs ever. Long enough to be challenging but short enough to run really fast.